This is in a graphic nutshell our pelastration approach. We start from an unbreakable, almost infinite stretchable, membrane. When a (tubular) part of this membrane penetrates another tube a white hole or white cigar is created in which two type of 'hyperspaces' are combined in a new UNITY. They are coupled as long as the white cigar exists. A black hole happens when the system decays. We call these white cigars: ISLANDS or pellons. 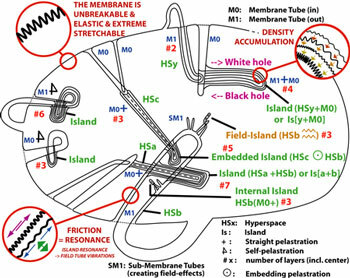 Above image shows that in the inside and outside of islands the membrane can create additional sub-islands or that other islands can be embedded. By this very simple - no mathematical - engineering system all motion and micro- and macro-cosmotic events can be explained in a kinetic way. This approach is not contradictory to experimental measure events, it's just another way to look to the Universe. So we are all connected to each other by a mutual internal layer of the same giant space. The boundary of that space is an incredible flexible membrane which is made of gravity tubes, and we call it the gravity membrane (MB). That membrane is invisible because it is made from the smallest possible particles, or better of tiny tubes. When these tube interact they form particles and/or waves. The interior of that giant space contains the basic ingredients of all known and unknown energy processes, natural laws, knowledge, life forms and materials, and derivated events. By an ingenious way of folding new dimensions are created, which are connected directly via their common joining zones or indirectly by specific conditions. Our Big Tube theory is based on a remarkable simple key process that we call: Pelastration. 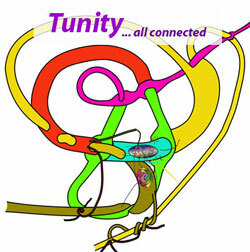 In our understanding every essential energetic 'joint' or 'action' is or is the result of combinations of pelastrated tubes originated from several dimensions. This concept - artistic, intellectual and intuitive appealing to me - may offer insights and motivation to people looking and searching for a understandable proof or a view of their destiny, of their reason of being in this life. I can assure you that since I started to understand the Tunity of US I looked to people that I met in a new 'other way'. At least I have now an image how such Tunity works, and that's a relieve. And you can be sure that You and I are connected ... not only by Internet but also by the fundamental source. This Unifying concept may also offer Cosmologists a solution for the cosmic puzzle.